The world's leading trade fair for logistics, mobility, IT and supply chain management, transport logistic, is back in Munich, Germany from June 4 – 7. Wednesday 5 June: On the following day, Perolo will be organising its “traditional” wine-tasting evening from its exhibition stand – the company is celebrating its 100th Anniversary this year. We've created an interactive overview of all tank container companies that are located in the ITCO Tank Container Village. Want to know who is who? Just click a company name in the map or find more information in this post. Is your tank container company located outside the ITCO Village? Leave us a message and we'll add your information to the list. Meet team TankContainerFinder.com in Munich! We are attending from Monday till Friday and are happy to discuss our platform and how we empower digitization, collaboration, transparency and decentralization within the tank container supply chain. Contact Nick Alberts via our chat or nick@tankcontainerfinder.com to schedule a meeting. 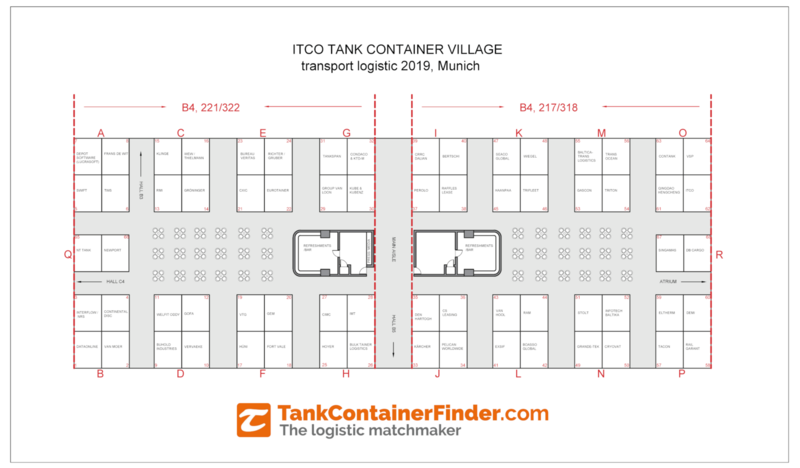 Download the high-resolution interactive PDF map with links to all exhibitors in the ITCO Tank Container Village at the transport logistic 2019 in Munich. We provide you with a full-service Depot Management System (DMS) which will prove itself to be the easiest way to control all tank container related businesses. We ensure efficient operation of transport and storage of chemicals and refrigerant gases in tank containers. Both at home and abroad. Safety and quality always come first. Swift Engineering - Manufacturers of flanges, manways, manholes,and stainless steel products for the Road Transport, Food and Beverage and Shipping Industries. Temperature Control Equipment from Klinge Corporation, the World’s Leading Manufacturer of Specialized Refrigerated Transport Containers. For over 75 years, WEW has been pioneering innovative modular solutions for safely transporting some of the most toxic liquids and gases known to man in civilian and military supply chains. Gröninger Cleaning Systems is an innovative, global designer and manufacturer of (high and low-pressure) cleaning systems. The company provides complete systems, from simple units to turn-key solutions. Curt Richter’s transport solutions address the three central challenges of the modern logistics age: cost-effectiveness, delivering the right quantities of goods on time and handling natural resources in a sustainable manner. CXIC Group is a privately owned enterprise group involves in manufacturing, trading, transportation, researching and development. Eurotainer has a diverse fleet of tank containers for the transport and storage of liquids and gases. Tankspan providing solutions to all your tank container leasing requirements. CONDACO & KTD-M GMBH has experiences in all kinds of operational and technical matters in the container industry. Group Van Loon offers one-stop shop solutions for tank container and special logistics. Your partner for all services in the transport of liquid hazardous goods and naturally harmless chemicals. Professional tank container manufacturer located in Jiangsu Province. NewPort Tank Containers is a leading tank container operator with substantial operations in all major trade lanes. Interflow is a leading supplier of worldwide logistics and distribution services. Dataonline is helping companies maximize the utilization of their industrial assets. Welfit Oddy specializes in the design, manufacture and sale of tank containers, bulk liquid shipping containers and transport containers for the international chemical and food grade logistics market. Buhold Industries will strive to achieve this by being the most reliable, innovative and cost-efficient producer with the biggest range of tank containers of the highest quality and reliability, utilizing the most advanced production and process technology and economies of scale. VERVAEKE offers tank transport as well as logistics and related services from 12 sites situated in Belgium, Luxembourg, France, the Netherlands and Germany. For more than 20 years, we have established ourselves as the leading coating company for ISO tank containers. China International Marine Containers (Group) Ltd. (CIMC) is a world-leading supplier of logistics and energy equipment, headquartered in Shenzhen of China. Monitor and control your tank equipment & tank supply chain operations. HOYER is a global market leader for transports of liquid goods by road, rail and sea. Our fleet of chemical, feed and food grade tank containers ensure that we can offer a complete logistics solution for both short and deep sea bulk liquid transport. CRRC Dalian Locomotive & Rolling Stock Co., Ltd. (hereinafter referred to as CRRC Dalian) originally founded in 1899 now has become the only key large-scale state-owned enterprise in China not only independently developing diesel locomotives, electric locomotives, engines and urban transit LRVs but also exporting them in batches. Bertschi specializes in logistics services for liquids and solid bulk products for the chemical industry. PEROLO SAS is a worldwide company specialised in the design and manufacture of the finest tank safety and fluid transfer equipment for oil, chemicals, powders, liquefied gas and foodstuffs. Raffles Lease manages and offers for lease worldwide a wide range of containers including dry, tank, refrigerated and other special containers. Seaco has one of the largest container leasing fleets of standard and specialised shipping containers in the world. Wiegel is your partner for vehicle maritime and drive technology. Haanpaa Group provides total logistic solutions to your liquid transportation needs. Trifleet Leasing is the largest owner-managed tank container leasing company in the world. We are a prime lessor and recognized global top 5 player with 25 years of experience. We specialize in providing integrated logistics solutions, ensuring the delivery of goods by any means of transport on the optimal route and with minimal costs. Our goal is to provide logistics services according to clients’ needs and cargo nature Shipping with Transocean is simple – it’s Going Your Way. GasCon is a highly certified Pressure Vessel manufacturer specialising in vessels customised to your needs. We are the world's largest and most efficient intermodal container leasing company. Contank has been dedicated for more than 25 years to the transport of chemicals both ADR and non ADR. Whether you need quality fluid-sealing products designed for reliability and safety or expert advice and installation support, VSP Technologies is at your service. Providing high quality, safe and efficient logistics and transportation service for foreign customers. The ITCO mission is to promote and represent tank containers as safe, cost-efficient and flexible means of transport. Singamas Container Holdings Limited (“Singamas”) is a leading manufacturer of containers, operator of terminals and container depots and provider of logistics services. We are the only company to offer our business customers in all sectors rail transport across Europe from a single-source provider – quickly, efficiently and reliably. We are one of the worlds leading Logistics Service Providers (LSPs) when it comes to the safe and reliable transport of bulk liquids and gasses for the Chemical Industry. CS Leasing is your committed partner for standard and specialised container and leasing services, using our expertise and agility to your advantage. It is the only manufacturer in the world that builds tank containers in stainless steel (for chemicals) and in aluminium (for powders) and gas tanks in stainless steel and carbon steel within the same factory. RAM Intermodal Software is a leading systems provider to international tank operators, container leasing organisations and intermodal equipment traders. The world's leading tank container lessor with a fleet of over 60,000 tanks, nobody knows the business better than us. Boasso Global is the premier provider of depot, maintenance, cleaning, and transportation services for ISO tank containers in North America and Europe. The world’s leading provider of logistics and transportation services for door-to-door shipments of bulk-liquid chemicals and food-grade products. Our company carries out cargo handling by means of roads transshipment complexes (RTC), directly (board-to-board) and at the berths. Integrated in designing, casting, machining, assembling, inspection, testing, marketing and service. Cryovat has been focusing on the market of industrial gases for almost 50 years and cooperates with engineering companies, industrial gas distribution companies and EPC-contractors for cryogenic equipment. With the electrical tank container heating systems, Eltherm developed a real alternative to heating with steam and Glycol and created some new options for applications. DEMI Container Services bv offers repairs, modifications, inspections, refurbishments and special projects for tank containers & trailers of all sizes and manufacturers and for all purposes. Our core business includes rental of tank- and IBC-containers for the transport and storage of pressurised gases, liquid chemicals, foodstuffs and powdered products. Rail Garant Group provides transportation for unitized goods.